The timestamp on this photo says it was taken Monday at 4:59 pm. That sounds right. 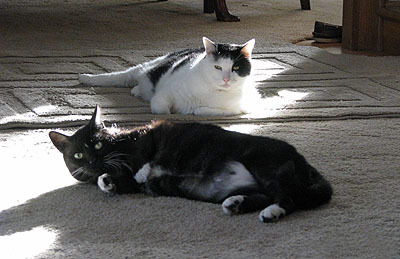 This is pretty much what things look like around here between 4:30 and 5:00 every day: both cats in the living room staring greedily at us until we give in and feed them. Really, their internal clocks are amazing. And the staring always works, eventually. I was going to write one more post today about Libya, but I gave up. I don’t know what’s going to happen next, I don’t know how things are going to turn out, and I don’t really know if we’re doing the right thing. As Matt Yglesias says, in this case “you have everything done right—a UN Security Council resolution, backing from the Arab League and the OIC, and a bad guy who is, loosely speaking, adequately nuts to seemingly put everyone off.” But I’m still not sure we really know what our endgame is here. For more, check out Josh Rogin, Peter Feaver, James Joyner, and Marc Lynch. In the meantime, though, enjoy the cats. They are blissfully free of any concern beyond their next feeding time.